Heritage Trails weekend has passed by for another year. What fun it was and a success for those in Biggsville, it meant a lot of things. Friday garage sales, yard sales, and The First State Bank of Biggsville put on their Appreciation Dinner. Friday night was the street dance with music by Mike Cole of Media. Saturday started off with more sales, a pancake breakfast by the Boy Scouts, and at 10:00 a.m. the 32nd annual parade with the West Central Band, Steve Graham, and Mrs. Harold Young providing the music. Of course it would not be a Biggsville Parade without "Old Merry", lots of special people, floats, classic cars, tractors, and of course kids, the clip-clop of horses and all those things that make a parade special. Best of all, it was good weather. All those who took part in the parade received a ribbon. After the parade it was off to the Children's Money Scramble supported by The Biggsville State Bank. Then it was off to the Chicken and Noodle Dinner sponsored by the United Presbyterian Church of Biggsville. What good eating, but you needed to get there early. Sunday was the Band Fest at Ricky Reid Park. All those who attended had a great time but the rain clouds rolled in so the Band Fest came to an earlier close. The weekend for this year is over but what a success. See you next year. 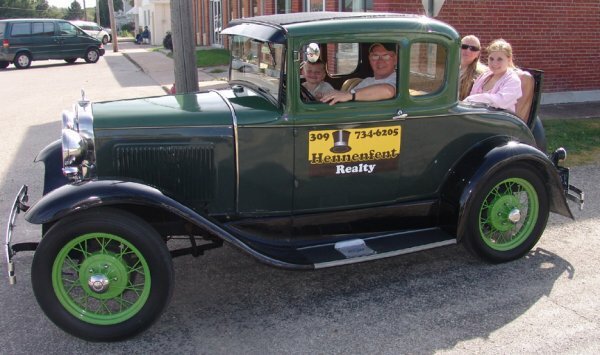 Bob Onion with 3-1/2 year old grandson Noah, enjoys driving Gilbert Hennenfent's 1920 Model A Ford in Biggsville's parade Saturday. It has a cloth top, black fenders and three shades of green true to its era, including chartrouse green spoke wheels. (Choices then were yellow, blue or green.) The car is a sharp way of advertising Hennenfent's Realty business.